When we tell a customer that their product has to ship via truck, and then we proceed to ask them more questions about the delivery location (residential or commercial, lift gate service, inside delivery, etc) they are often times confused and put off for the very simple fact that they don't know the difference between a UPS and a Truck shipment, or why we need all this additional information in order to ship their order. And who can blame them?! After all, UPS packages come in a truck! 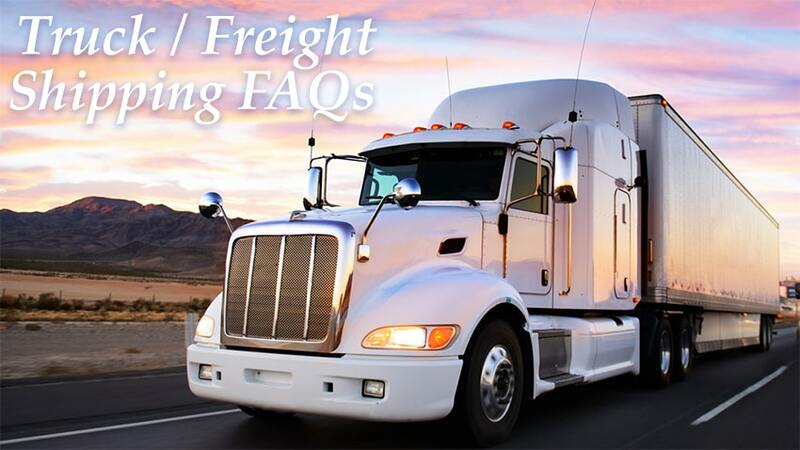 So I've put together this Truck Shipping FAQs guide to answer all your questions about freight delivery from Binding101. If you don't see the answer to your question here, please call us at (866)537-2244 (866)537-2244 for assistance. 1. Is my order still free to ship when it has to ship via truck? Yes! Our free shipping policy applies to both stand rad ground UPS and standard truck freight shipments. "Standard truck" means that it is delivered to a location with a loading dock or a fork lift where the consignee (i.e., the customer) is to unload the item. Any additional delivery services required outside of the standard procedure will be assessed additional fees. 2. What other service are there? Popular additional truck services include lift gate service, inside delivery, prior delivery notification, and white glove. Here is a list of the truck services that you have the option of adding on for an additional fee. Lift Gate - This is a special truck that has a lift gate on the back to lower items to the ground. It is a required service for delivery to locations where a loading dock or fork lift is not present. Inside Delivery - This is a service that some truck companies offer where the driver will bring the items into your warehouse. If the order is delivering to a location where there is no loading dock and you want the order brought inside for you, then you would need both a lift gate service and inside delivery. Notification Prior to Delivery - This is a service that will allow the trucking company and/or driver to contact you before your order is delivered with an approximate delivery window. Residential Delivery - Residential delivery is required when an order is shipping to a home, rather than a business or commercial address. Often times a smaller truck is sent than what would be sent to a commercial location. White Glove Delivery - White Glove delivery service includes a call to schedule a delivery appointment, trained professionals to unload your item from the truck, bring it into the room of choice, unpack the item, and remove all packaging debris from the premises. Please note that White Glove delivery will typically add 5 - 7 business days to your order's transit, and only includes 30 minutes of on-site time. If on-site time beyond 30 minutes is required, you may be responsible for additional fees. Additionally, this service does not include set-up or install of the items being delivered. The price for additional services will vary depending on your delivery area. Please call (866)537-2244 (866)537-2244 for a quote. 4. Why won't the driver bring my items inside? As part of the common carrier driver ICC regulations, truck drivers are required only to bring merchandise to the tailgate (end) of their vehicle. It is then the customers’ responsibility to remove it from the truck. If you do not have the personnel or facilities to handle unloading, additional pre-arranged delivery services will be necessary. 5. What happens if we're not here when the truck delivers? You must be present to inspect and sign for a freight truck delivery. If you are not available at the time of delivery, or if your office is closed, this is considered a "failed delivery attempt" by the freight company, and you may be subject to additional fees such as storage charges and/or re-delivery. Carrier’s re-delivery fees usually range from $25 - $125, but will vary on your location. Also, keep in mind that if the freight carrier is not able to contact you for delivery, they may return your item to one of our warehouses and you will be responsible for the cost of return shipping and restocking fee. 6. What do I do once the order is delivered? At the time of delivery, the carrier will provide you with a Bill of Lading (BOL) and/or Delivery Receipt. Please thoroughly inspect your shipment. at the time of delivery and before you sign for the shipment. Items rarely get damaged in shipping; however, in the event that damage does occur, all damage and defects MUST to be noted on all copies of the BOL and Delivery Receipt in order for us to be able to file a claim with the carrier and to assist you with a return, replacement, or replacement parts. In addition, we must to be notified within 1 business day of all damages, defects or missing pieces. After 1 business day, you will be financially responsible for any replacement part(s). If your shipment is severely damaged, refuse your delivery, note the BOL "refused due to damage", and contact us immediately. *** If you do not have time for an inspection or the driver rushes you, YOU MUST WRITE "subject to inspection" next to your signature on the Delivery Receipt and BOL. *** Please remember that any damage or defect must be reported within 1 business day as all returns need to be initiated in our system within our Standard Returns time-frame of 30 days from the date you receive your order. If you discover damage or defects not noticeable after the carrier leaves, we will work to resolve the issue. Please call customer service at (866)537-2244 . 7. What are the definitions for common freight terms? • Common Carrier - Company that provides transportation services to the public in return for compensation. • Consignee - The person or place where a shipment will be transferred for the last time (destination); the individual or organization to who the goods are addressed. • Dock to Dock - As part of the common carrier driver ICC regulations, truck drivers are required only to bring merchandise to the tailgate (end) of their vehicle. • Inside Delivery - Inside delivery means that the driver will carry the item(s) for you through the threshold of your building. For residential deliveries, this means inside your garage. Unfortunately they are not authorized to use stairs or elevators, nor will they place it in the room of your choice. • Lift Gate Service - When the destination location does not have a loading dock or forklift, manual unloading is necessary. This requires a lift gate, which is a motorized platform attached to the back of certain trucks that can lower a shipment to the ground. • Loading Dock - A platform, generally the same height as the trailer floor, where trucks are loaded and unloaded. • Residential Delivery - Locations other than what the carrier defines as a business location; one that opens and closes each day to the general public at set times. A business may be classified as a residential if it is located in a residential zone, even if it opens and closes at set times. Schools, colleges, and churches located in residential zones could also incur residential fees. • White Glove Delivery - White Glove delivery service includes a call to schedule a delivery appointment, trained professionals to unload your item from the truck, bring it into the room of choice, unpack the item and remove all packaging debris from the premises. Please note that White Glove delivery will typically add 5 - 7 business days to your order's transit, and only includes 30 minutes of on-site time. If on-site time beyond 30 minutes is required, you may be responsible for additional fees. Additionally, this service does not include set-up of the items being delivered.